The Koyna Wildlife Sanctuary, the Koyna Backwaters, Vasota Fort and the Kaas Plateau represent the aqua, terra and aero elements that offer the ultimate paradise for nature and adventure lovers. The variety of adventure and wildlife activities that exist around are limitless. The Koyna Wildlife Sanctuary is uniquely situated between the backwaters and the western escarpment on the other. It is blessed with a high density of forest covering an area of around 426 sq km and with an altitude ranging from 1900 to 4300 ft, one of the few remaining Bio-diversity Hots pots in the world. It was notified in 1985 as a wildlife sanctuary. A part of this sanctuary had been declared as Sahyadri Tiger Reserve and now some part of the sanctuary is declared as a World Heritage Site by UNESCO. This forest hosts a large variety of animals and birds. Koyna Backwaters range to a maximum of seventy kms. It is one of the longest backwaters in India. Either side of it hosts diverse flora and fauna. The area can be explored by boats. The twin forts Old and New Vasota are located inside the Sanctuary – ideal place to give a panoramic view of the backwaters, the surrounding forests and the Konkan belt. 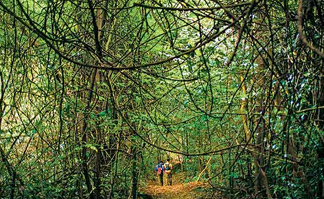 The trek to the forts offers a combination of both wildlife and adventure. Kaas Plateau and Lake: This world famous location is known for the wild endemic flowers and plants, Insects and reptiles as well. Now in 2011 it is declared a World Heritage Site by UNESCO. Thousands of nature lovers, biology students, Naturalists and Scientists from all over the world come to visit and for their research and studies in the months of August and September. This plateau is at an altitude of 4098 ft above mean sea level. Depart at 7 am from a designated location in Pune. Enjoy breakfast enroute and visit Kaas Plateau and the lake; continue further and reach the orientation point around noon. After lunch tralx for some time and then you can take a dip in Koyna waters. Evening wilderness walk. Back to the resort in evening and fresh up before dinner and bonfire. Rise early and proceed for trek to Vasota fort after breakfast. Lunch will be on-route. Reach the resort early evening. Pack up and start back to Pune, reaching around 9 pm. Accommodation on Group Sharing Basis in Tents at Resort. Personal expenses such as Phone Calls, Laundry, Tips etc.